This article started life well over a year ago as a script for a video slide-show. As ever, I seriously underestimated the time it would take to make and so missed several deadlines. I’ve not given up. Maybe I will still produce it. Till then, rather than let the photos and script languish on my hard-disk, I thought I’d share them as my Wednesday’s post this week. 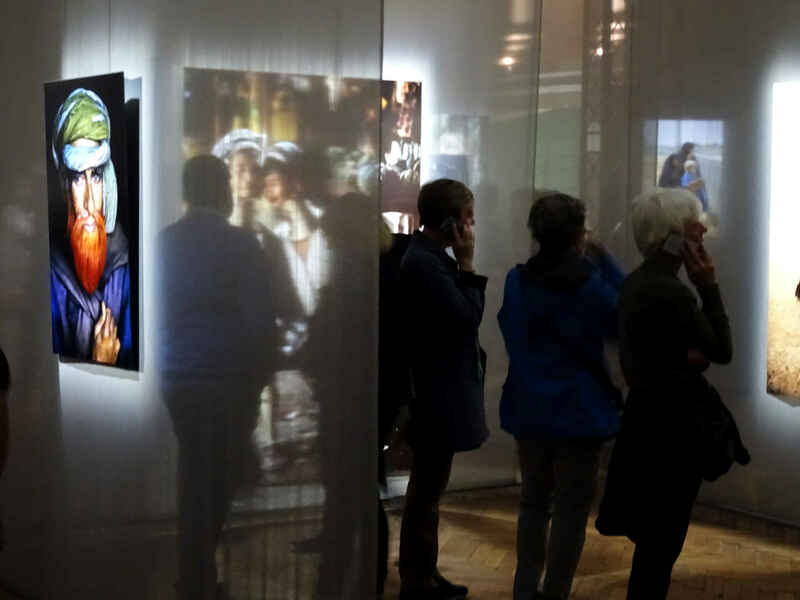 The World of Steve McCurry exhibition at the Bourse in Brussels opened in March 2017. It should have closed in June, but was so successful it was extended until August. I carried this advert around in my pocket for weeks, but still didn’t manage to get in a visit until the very last week of the extended period. I’m glad I did though. The exhibition was very good indeed, and not just for the fantastic photography. The way the exhibition was arranged was also brilliant. The pictures were hung against panels of gauze-like material and spot-lit. Instead of a traditional exhibition space with rooms and walls and tables with prints on them, this was more like a labyrinth of passages that the viewer walks through and tries to find their way, drawn from one picture to another. It was a very imaginative, very clever staging that made full use of the space available. And even though the exhibition was crowded, still there was something meditative, almost dream-like, about wandering through the darkened space, from picture to picture. Holding the audio guide to one ear and quietly listening to Steve McCurry’s voice talking about different pictures: about the subjects portrayed, or about the historical or political background, or about incidents that he managed to capture, or the techniques he used to get the pictures. 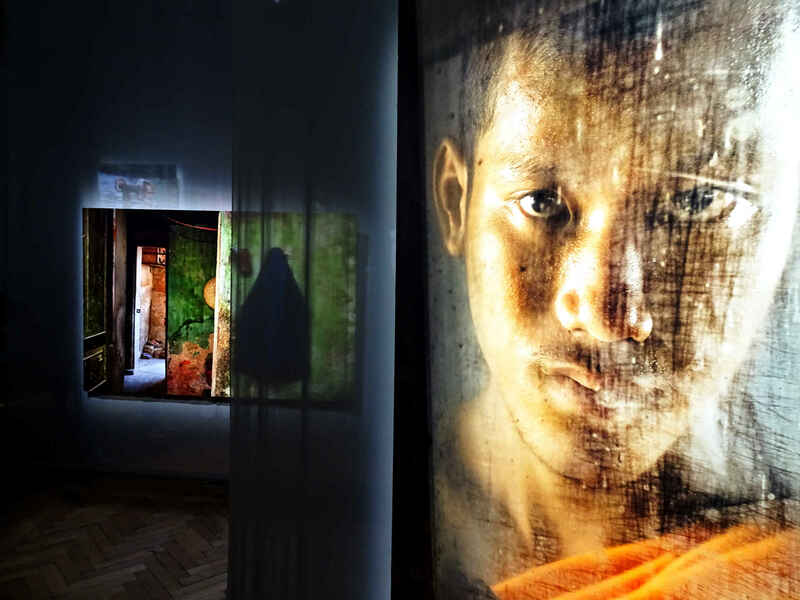 McCurry’s photos were hung thematically, although the themes were not hammered in. The ones that stood out for me were the portraits. Individual ones or pairs. There were people in action, people at work, and landscapes (a few). Images of devastation natural and man-made also. The Japanese tsunami of 2011, the fall of the Twin Towers, the devastation of the first Gulf War. And of course among the rest were the iconic photos. The ones you’ve seen in films or newspapers, magazines or on the Internet, but might not have been able to identify as just Steve McCurry’s work. 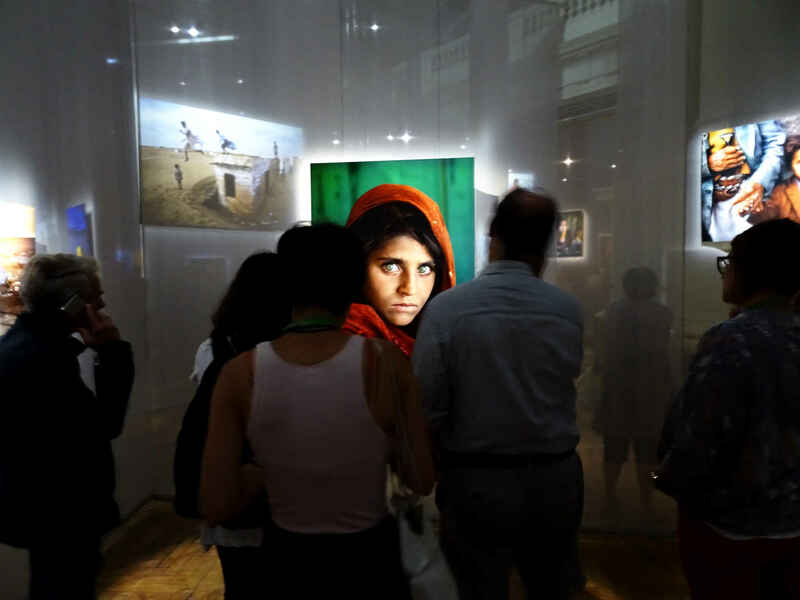 One of these photos, the portrait of “The Afghan Girl”, “the girl with the eyes”, probably the most well-known of McCurry’s portraits, was featured in the advertising for the exhibition. One section of the exhibition was given over to the black and white photos he took in 1979 in Afghanistan just before the Russian invasion. These were the photos that first made his name and they remain fine examples of his work. 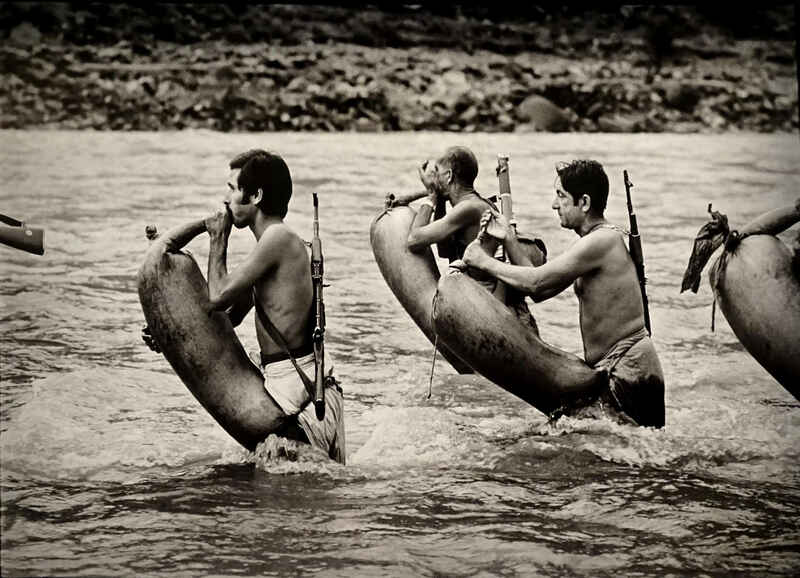 I particularly liked the picture of militia preparing to cross a stream with the help of inflated goatskins. There is a scene remarkably similar carved in stone from Ancient Assyria displayed in the British Museum. I happened to have seen it just a few days before. 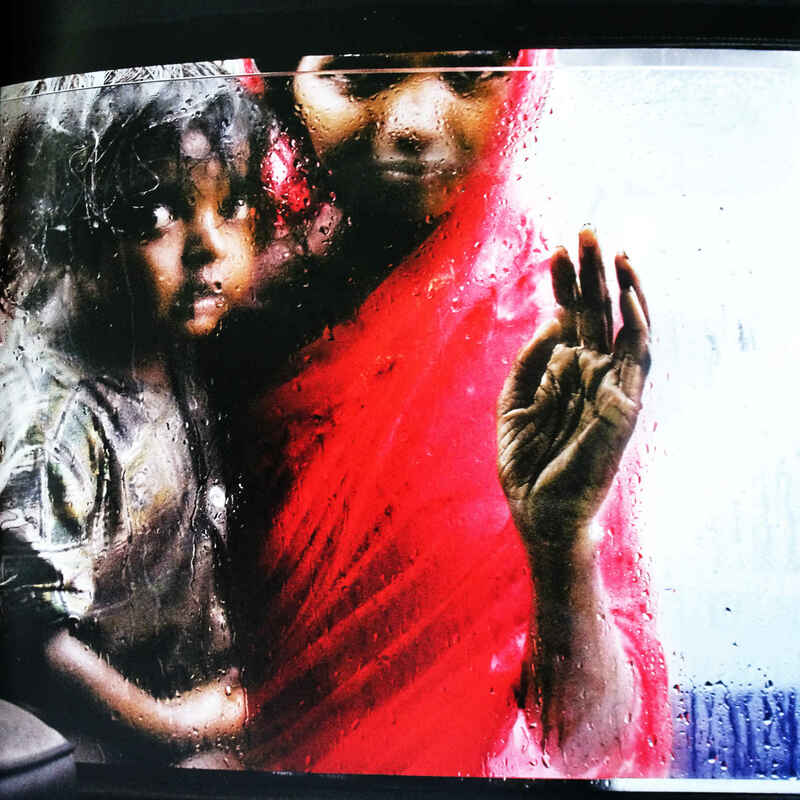 However, the most engaging feature of McCurry’s work since those early photos is his use of colour. And in the exhibition spotlights it was the colour that shone out at you. 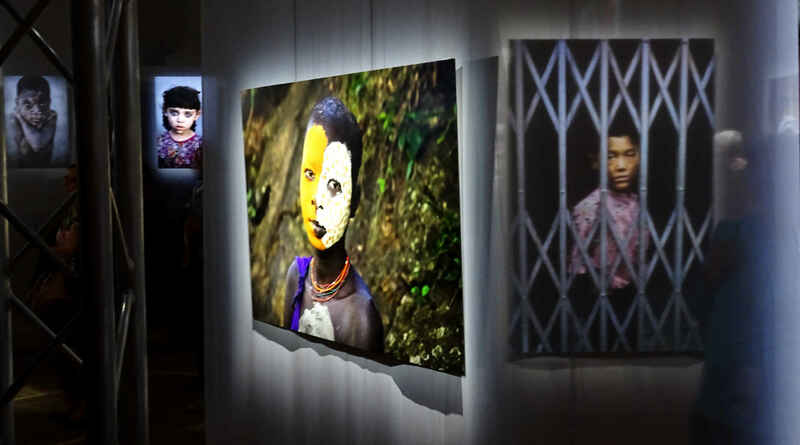 Around the exhibition, in various corners of the labyrinth, a few video films played, discussing McCurry and his career. And to one side of the space projected on a screen and running on a loop, was a documentary. National Geographic’s 2002 film about the search for and identification of the Afghan girl herself, Sharbat Gula, now an adult. There was one thing I didn’t find that I felt would not have been out of place: some discussion of the responsibility of the photographer and the ethics involved. For example, how to justify this? Taking a photo of a beggar from the window of your car before being rushed away without giving her even the small coin she was obviously hoping for. And then publishing her photo in order to make money from it yourself. And then writing about the taking the photo: “it comes from a kind of conditioned reflex, she approached the car and I instinctively took the shot.” As if there were no ethical quandary. Or what about that National Geographic film? Personally, I found it extremely uncomfortable. The poor woman being treated like the subject of some race-biology investigation because it was so important to be sure the adult had the same eyes as the child — whose name McCurry had forgotten, if he’d ever known it. Steve McCurry has an astounding eye and has made some iconic photos. This exhibition rightly celebrated that fact. But ethics ought to be something photographers grapple with. It might seem less important nowadays. Technology has put cameras in the hands of billions around the world. Street photography and candid portraiture are open to more or less everyone. But is it really less important? And yes, I know about people in glass houses not throwing stones. I have taken my share of candid pictures, done my share of street photography. But that doesn’t mean I think I’m immune to ethics. I struggle with these questions. It would be nice to know how Steve McCurry tackles them. Lacking anything from the man in this exhibition, let me speculate. 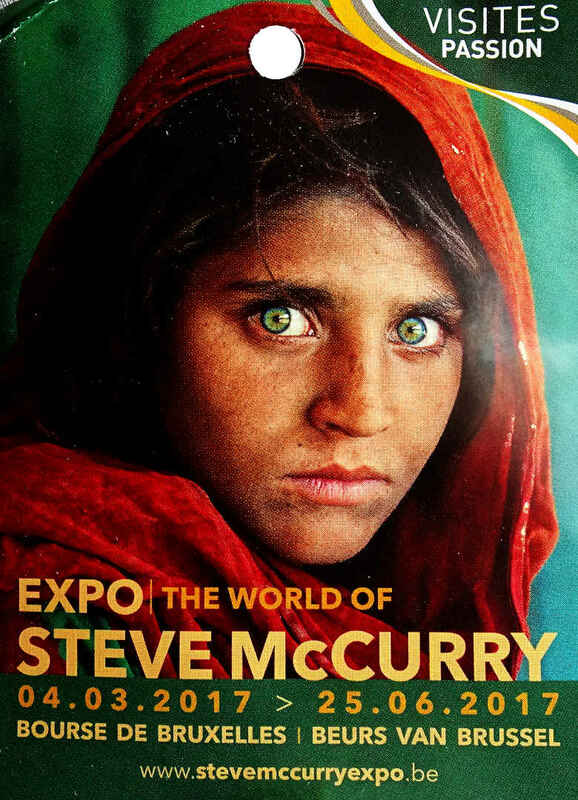 I expect McCurry does wrestle with the ethics of his profession. I guess he would argue that his pictures have helped focus attention on poverty and disasters. That they have to some degree helped alleviate distress. He might point to the use charities have made of his photos to attract funding for various aid schemes. I imagine he might say that his portraits give a face to specific issues. Problems the world needs to tackle. I suppose McCurry would also argue that he has helped his (western) audience expand their idea of the (developing) world and become more open. And I think there would be truth in all those arguments. They are perspective I have a lot of sympathy for. It’s just, I would have liked to see it expressed in this exhibition alongside all the photos. Ethics is, I think, a part of the labyrinth we all navigate daily. Including it in this labyrinth of an exhibition would not have been out of place. Not mentioning it feels a bit like ignoring the elephant. 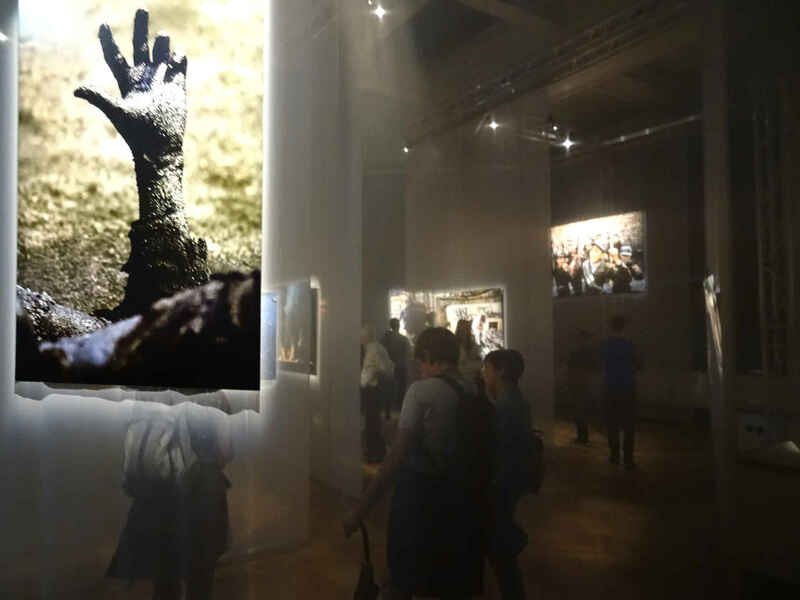 I took all the photos in the above at the World of Steve McCurry exhibition at the Bourse in Brussels, August 2017 with three exceptions. 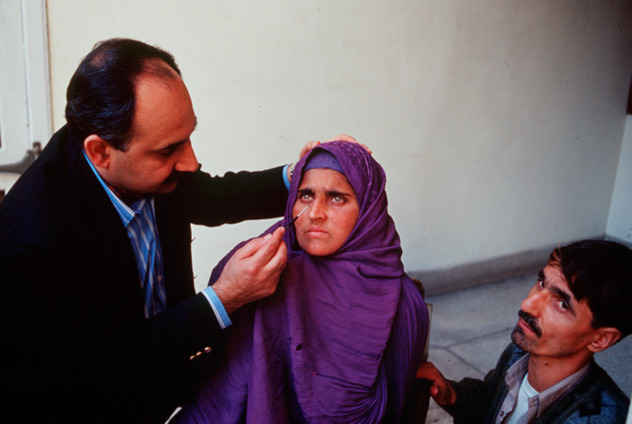 The picture of a doctor examining the eyes of “Afghan Girl” Sharbat Gula comes from Doctor Sonnet’s own website, here. The portrait of McCurry himself in the featured image in the header is taken from Wikimedia Commons here. 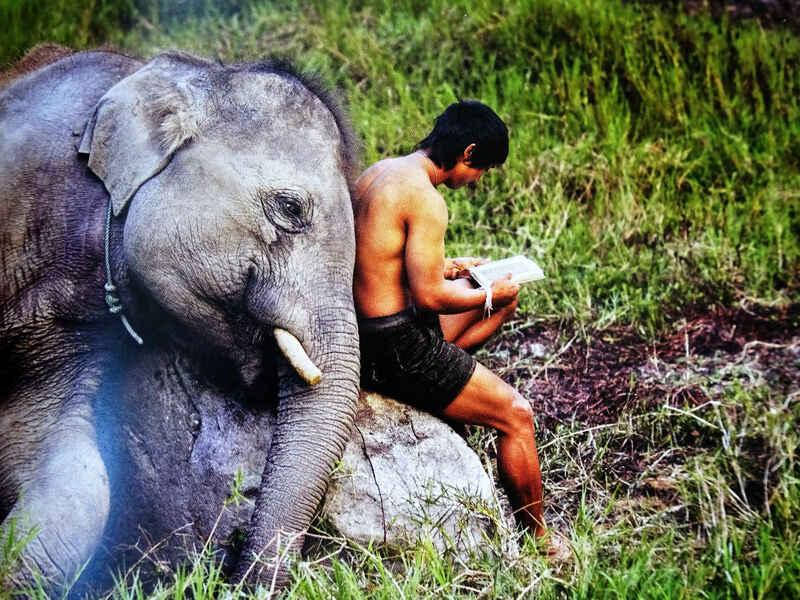 The picture of the reading man and the baby elephant comes from Steve McCurry’s book The Iconic Photographs.